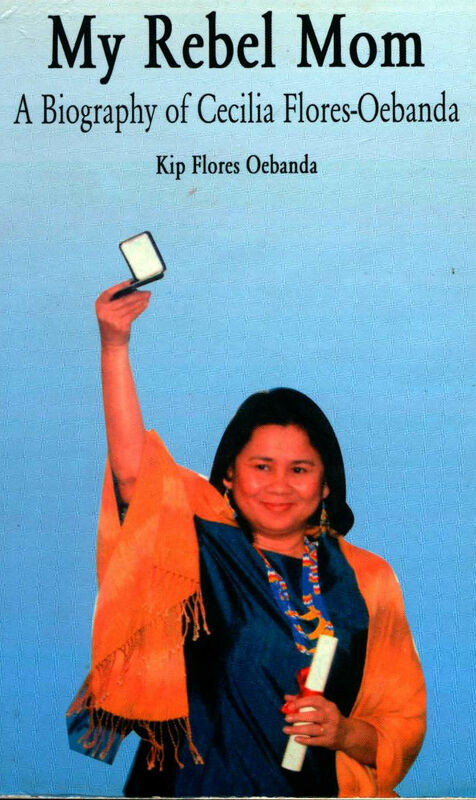 Cecilia Flores-Oebanda is a Filipino freedom fighter lost in history. Most known for being the founder of the Visayan Forum Foundation, an organization that works to support and develop the lives of Filipino people specifically the marginalized sectors of the urban poor peasant woman and children who, regularly are at risk of domestic work abuse and human trafficking. I first came across Cecilia on a bookshelf of a restaurant playing the role of decor. Stacked between the iconic works of Jose Rizal and a cookbook of modern East Asian cuisine. With the title "My Rebel Mom" I was compelled to slip the thin book into my bag with full moral intentions of returning it. From there I began to learn about such an awesome woman, a fighter, with a dark past telling of the culture and history of the Philippines in the mid-60s to 80s. In the prologue, a section of a book most intermediate readers would skip, or at least accidentally start reading the first two pages of before moving on feeling it wasn't prominent to the actual story to be told; but within this prologue we learn the writer of "My Rebel Mom" is written by her son, Kip Flores-Oebanda. His reason for writing the story of his mother came from two places: curiosity of his mothers past, where and how it connected deeply to his birth and childhood within the walls of a prison, and the celebration of his mother present. Kip speaks from a flight in 2008 to London where Cecilia was going to accept a prestigious award for her social entrepreneurship, her works from within the Visayan Forum Foundation. He looks at her life of peace and love as a mother in more ways than biological as the key inspiration, it was the weight of love that comes hand in hand when creating this artful biography. Understanding the origins of the story of Cecilia Flores-Oebanda breathes and creates within it so captivating. Kip decides to understand his mother Cecilia, it was important to learn about his grandparents Jose and Anita, and how the life they created for themselves created Cecilia, Cecil for short. The life made by Jose and Anita was a common one for the people of the Philippines of the time (and arguably common for the people of the Philippines of today) Jose would joke saying, "instead of collecting products, he collected scars." Jose worked in both urban and rural labor, from sugarcane fields to dock work. Setting himself and his children in a cycle of uneducated labor work. By the time Cecilia was born her family had moved into the mountains near the sea, in a hut "made of random pieces of wood and tin from building construction sites and fallen trees" a setting more common than not for the Filipino people. Cecil was born during a storm; a theme that Kip felt fulfilled its prophecy, that Cecilia would live a life of struggle. During her childhood, at the age of seven she began working, again common for the people of the Philippines than (and now). She would sell dried fish early in the morning in 95-degree heat before school where she was ferociously bullied, to salvaging dumpster piles for a few cents on the recyclables. A common mentality in the Philippines was children were an investment; more hands meant more chances to make money. But again and again, when confining to a school teacher, her mother, and to her own conscious she reminded herself that her working in conditions clearly unsuitable for children was for the love of her family. The weight of her love brought her, along with the influence of her father, to participate in street fighting for three years building the tough skin she would be using in her future as Commander. Her poverty stayed with her till her college years. While the ghost of memories where a wealthy woman releasing German Shepherds on her as a child because people of a certain status believed poverty as a disease, and to have Cecilia peering through a crack of a window to watch television a threat to a certain lifestyle, Cecilia fought for the quality of her life; making money as a part-time model for soap and being awarded a swimmers scholarship, coming from living near the ocean. It was in the second half of her higher education she began molding her role as Commander Liway. It was when she began to lead groups for the Catholic Church to spearhead social transformation in urban and rural areas, was when during the Marcos regime turned to Martial Law and the suspension of the Writ of Habeas Corpus, meaning absolute government power and decision brought social unrest and the first democracy in Asia to its knees. She stood strong, as Cecilia's character would have her during the "social volcano ... Much like a real volcano, the people's mounting anger and dissension have exploded." The NPA (New People's Army) rose into the mountains; a group who saw the road towards communism within the Marcos regime and decided they were ready to fight. In a way Cecilia was too, she continued leading the Catholic groups in distraught rural areas where the question on everyone's mind was why Jesus couldn't save them from the Marcos regime. To which she would answer "'Sometimes, we have to free ourselves. Sometimes we have to free each other. That's why we are here for, to ensure that everyone is free.'" Her saying echoed and rang true, much so that one summer on her way to the Catholic group, she found their space, a small hut, destroyed and ransacked. Yet the fear that ran over her was not that of her life, but that of her family. Her love for them had her jetting towards home, the same one-room hut she grew up in, with her parents and sibling’s lives were in question. Up until halfway home, she ran into her brother, Jessie, urging her to run away. They came for her, the Marcos regime, and while her family was able to dodge danger by keeping their knowledge of Cecile's whereabouts unknown, they knew as much that if she would return, the life of her, and her family were numbered. And so she ran, the weight of her pain of leaving her family was a feather compared to the weight of the love and safety she had for them; so off into the mountains she fled, nothing but her willpower and strength to fight the storm that had been following her since birth.